Not in the heckler kind of way but in the spooktacular Halloween kind of way!! Because she knows how much I love Halloween The Thriftiness Miss sent this to me today "Instead of getting a treat bag on your front porch, you get a fun button in your inbox. 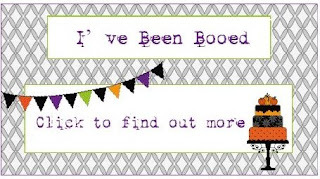 To show everyone that you've been booed...The button links back to Sweet Boutique AND the person who booed you as well (so others can find out what the game is all about)." And after all, if you don't already know how much I love Halloween you will soon learn with the start of October and blog hop and link up 31 Day Fright Fest I'm co-hosting. Hope to see you then. Boo :) Glad you liked it!